Buttery, sweet braised leeks meet a bright, mildly-tart dill-yogurt sauce. Great as a light vegetarian lunch or a side dish for broiled fish and meats. I don’t know if I’ve mentioned this yet, but I’m something of a leek fiend. The first time I saw them in the market bin, many years ago, I thought they were some kind of gargantuan scallion on steroids. While leeks are a member of the onion family, I soon came to learn (and love) their much more delicate flavor. I find just about every excuse I can to cook with them. 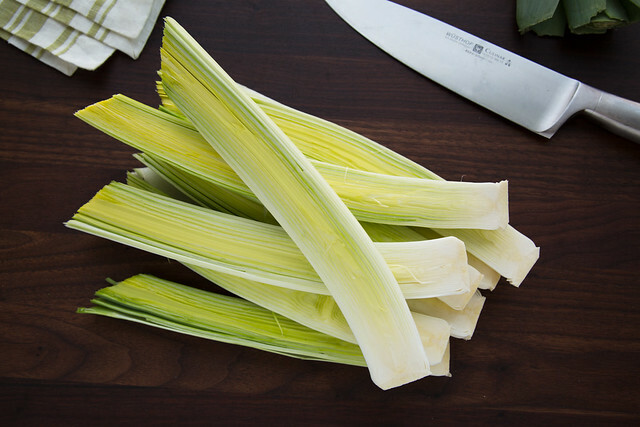 As an aromatic, leeks are great in a supporting role in everything from omelettes and quiche to soups and risotto. When they’re in their prime (usually late-fall through early-spring), nothing makes me happier than dishes that allow the leeks themselves to be the star of the show. 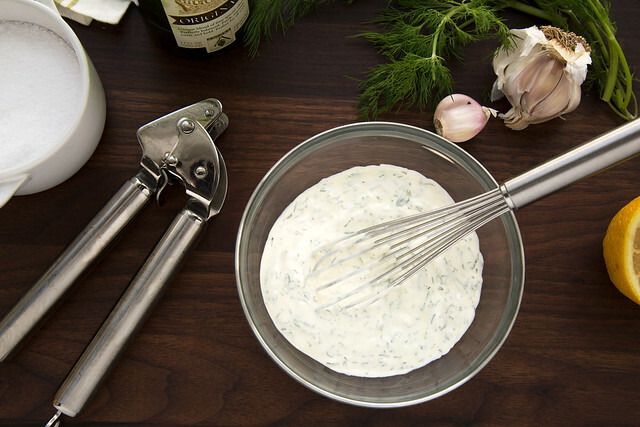 I love grilling them and serving them as a side dish with a light vinaigrette, as the base for fritters (one of my favorite Ottolenghi recipes), and as I’ve done here, braised and served with dill sauce. 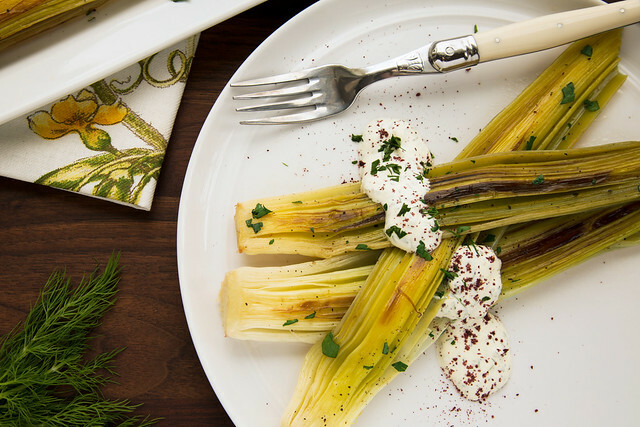 The main inspiration behind this recipe is Diana Henry’s book, A Change of Appetite, in which she tosses steamed leeks with olive oil, yogurt-dill sauce, and sumac. I’ve been on a bit of a sumac kick for a while now (a bright, lemony spice prevalent in Middle Eastern cooking), so when I came across Henry’s recipe, I instantly fell in love. 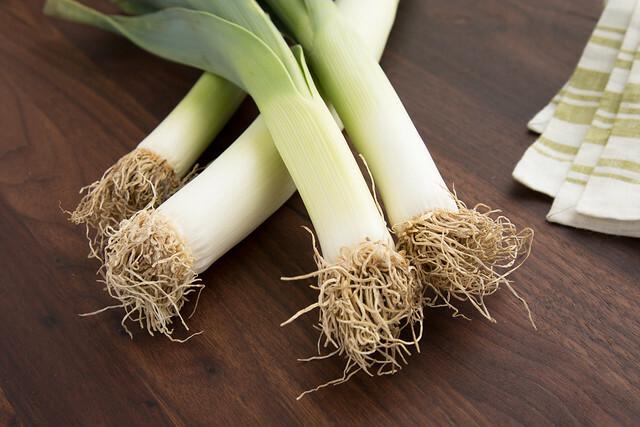 Seeing as it’s winter—the season for braised everything—I decided to try pairing the flavors with my favorite white wine braised leeks. 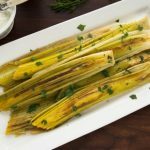 We really enjoyed the richness that the braising process lends to the leeks, against the bright, mildly-tart flavors of the dill sauce and sumac. 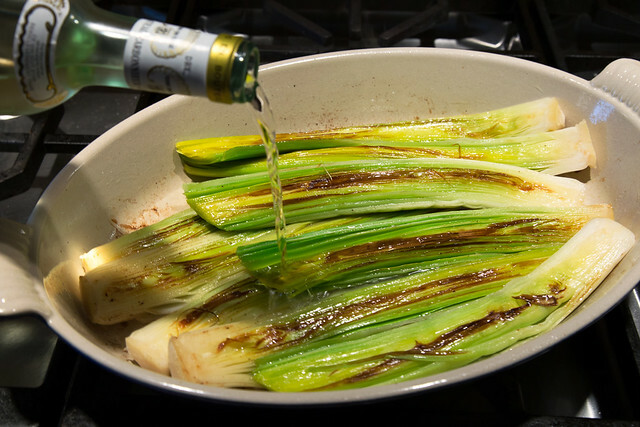 Instead of tossing the leeks in the sauce, we found that we liked them best dolloped, so that the sweet, braised flavor could really shine through. If there’s one point I can drive home about working with leeks, it’s this: wash them thoroughly! The leeks’ beautiful layers give them a wonderful texture, but they’re also the perfect hiding place for dirt and sand. A mouthful of leek grit will pretty much ruin a recipe (been there, done that, got the medal for a memorable batch of risotto in my early 20’s—not my finest creation!). Don’t let this deter you; leeks are easy to clean. When working with chopped or sliced leeks, I separate the layers and swish them around in a bowl of cold water, letting them soak for a few minutes before scooping them from the top (the grit will fall to the bottom of the bowl). I like to give them a final “good measure” rinse in a colander before cooking. When the root end is left intact and the entire leek sliced in half (as in this recipe), I gently fan out the layers and use the spray nozzle on my kitchen sink to direct cold water between them until I’m satisfied that they’re clean. 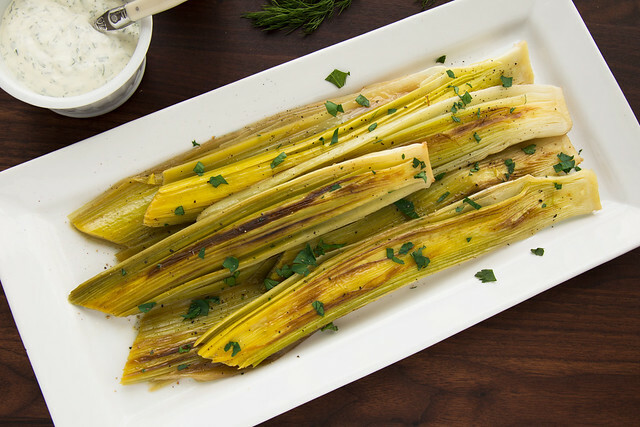 Braised Leeks with Dill Sauce are great for a light vegetarian lunch, perhaps with a slice of crusty bread on the side, or some spring greens, lightly-dressed with olive oil and lemon. I’ve also served these as a side dish to broiled fish with a crisp glass of white wine. This dish is very good served hot, but we like the leeks best just slightly warm or at room temperature. I think the sweetness really shines when they’re a bit cooler. If you happen to have leftovers, which I did when making these for this post, a quick trip to the blender with some chicken broth turns the leeks into a delicious soup (instructions in recipe notes). With their beautiful palette of yellows and greens, leeks are a great way to bring a pop of color into your winter menu (especially on days like today when the thermometer is reading a balmy 8 degrees). Think Spring, everyone! Did you know that I’m on Pinterest? Trim roots and dark green tops off of leeks, leaving the root end intact so the leeks don't fall apart when sliced. (Dark green tops can either be discarded or saved for making stock.) Discard any tough outer layers. Slice leeks in half lengthwise and rinse well to remove grit from between the layers. Dry and set aside. In a large sauté pan or stove-safe gratin dish, heat butter and olive oil over medium heat until foaming subsides. 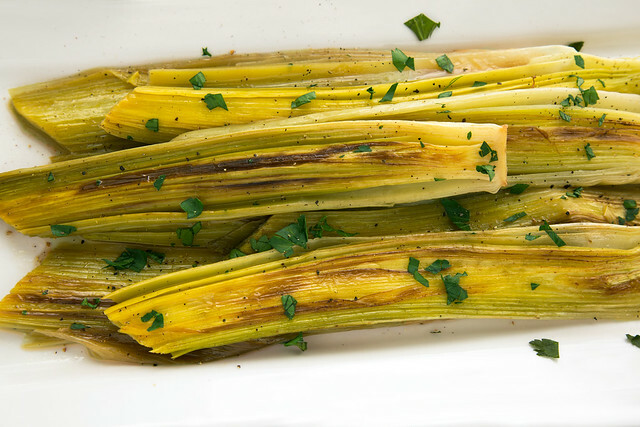 Add leeks in a single layer, cut side down, and cook until lightly browned, about 3 minutes. ** Turn leeks, discarding any papery layers that dislodge, and brown the second side, 2-3 minutes. Add wine to the pan, scraping up any browned bits, and simmer for 2 minutes. Add enough broth to come about halfway up the sides of the leeks. Cover with a lid or foil, reduce heat, and gently simmer for about 20 minutes, until leeks are tender when pierced with the tip of a knife. Leeks should be soft, but not mushy. 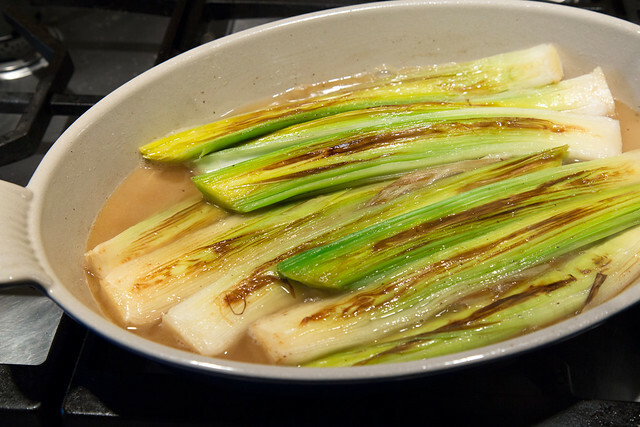 Transfer leeks to a platter with a slotted spatula, draining braising liquid. Sprinkle with a pinch or two of salt, some freshly-ground pepper, and let cool. 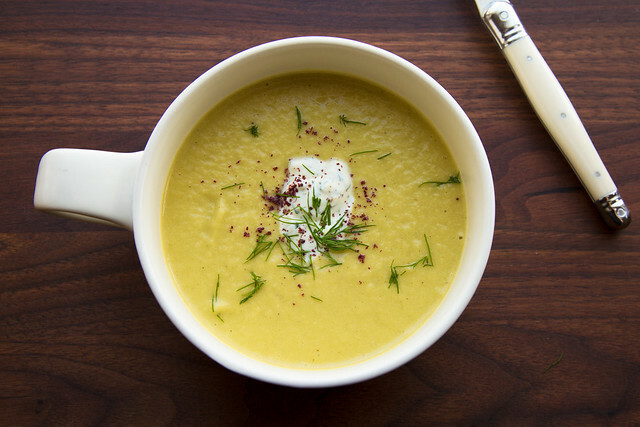 Leeks are best served slightly warm or at room temperature. When ready to serve, spoon a dollop of Dill Sauce atop each leek and sprinkle with ground Sumac and additional freshly-ground pepper. Looks great. what a great idea of using leek! I’ve never had braised leaks but these look awesome n I’ll definitely try them soon. Ditto what Michelle said! Looks incredible and I adore anything with dill. I love that you’ve included transformation instructions for the leftovers! I’ve used leeks in recipes before but never on their own. This looks like something I need to make! It sounds delicious and healthy.